Mostly interesting information about Sri Lanka; its history, culture, interesting places, things and anything that generally catches my fancy. Climbing Sigiriya isn't that hard but it is strenuous. It is not, however, for the unfit. There are steps all the way to the top; some of which are very narrow and steep. There are about 1200 steps. That's roughly equivalent to climbing 60 flights of steps of a 60 story building. But don't panic. It’s a lot easier than climbing sixty flights of steps in a building. 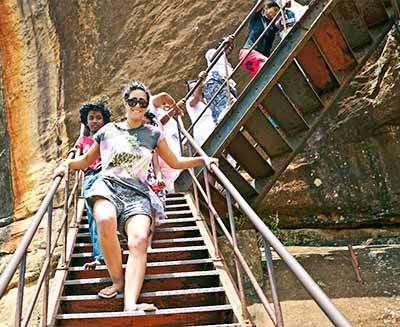 When you climb Sigiriya Rock take your time, rest often and drink lots of water. Proper footwear is strongly recommended. The best times to climb are early morning and late afternoon. Visit our webpage Sigiriya, Sri Lanka for a complete guide to Sigiriya. The easy bit is coming down. Was Galle the Biblical City of Tarshish? Is it true that Galle was Tarshish? James Emerson Tennent, who served as the colonial secretary of Ceylon (Sri Lanka) between 1845 and 1850, makes the assertion that Galle in Sri Lanka may have been the ancient biblical place referred to as Tarshish. There is no corroborating evidence to support this assertion. The general consensus is that Tarshish was located somewhere closer to Israel along the Mediterranean coast. Sri Lankan luxury goods such as gems, cinnamon, pearls, ivory and peacocks were exported since ancient times. It is most likely that King Solomon acquired these goods in the Mediterranean land of Tarshish. Copyright © 2013 Senani Ponnamperuma All rights reserved.. Simple theme. Powered by Blogger.